Uptown Chicago History: "This is a Red Line Train to Howard..."
"This is a Red Line Train to Howard..."
I work from home, so riding the L to get somewhere in the City is always a bit of a novelty for me. As I write this, I can hear the recorded voice from the platform of the Argyle Stop. "Doors closing. This is a Red Line train to Howard." I don't really live that close to the tracks, but every once in a while there is a quiet moment with no other traffic or people chatting on the street, and I can hear the recordings. It wasn't until 1993 that the Howard branch of the elevated was combined with the Dan Ryan branch via the State Street Subway to create the "Red Line" we all know and love. That was the year the CTA adopted color-coded names for all of its L routes. 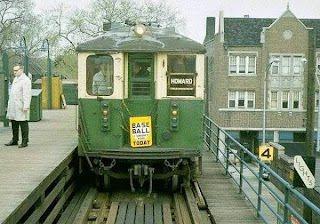 The old Howard Line, also known as the North Side Main line, was a series of sections originally built by the Northwestern Elevated Railroad Company. It stretched from Howard Street at the Border of Evanston all the way to the Loop. To learn more about the full history, visit Chicago-l.org This is a terrific site on the history of Chicago's train transportation. There is also a new book by Greg Borzo, published this past summer, called The Chicago "L" that has a ton of great photographs. I used to ride that el to Lawrence. I lived in Uptown back in the 70's. It's the Noyes stop in Evanston looking south toward Howard. Hi DarkPrince ... that's what the post says, that it became the red line in '93.